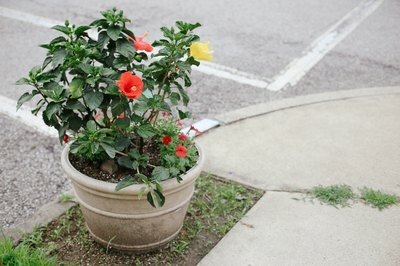 With showy flowers sometimes as large as serving plates, hibiscuses cause passersby to gape and demand, “Are those plants real?” Their height varies, according to species, from 3 to 30 feet and the size of the blooms from 3 to 12 inches. Hibiscus hardiness ranges from U.S. Department of Agriculture plant hardiness zones 5 to 12, with the rose mallow (Hibiscus moscheutos, USDA zones 5 to 10) being one of the toughest types and tropical hibiscus (Hibiscus rosa-sinensis, USDA zones 10 to 12) one of the most tender. The proper time to sow hibiscus seeds depends on your location. If you live in a zone lower than USDA zone 7, sow your hibiscus seeds indoors two to three months before your last spring frost. If your zone is USDA 7 or higher, you can sow them outdoors after the danger of frost has passed. Hardy hibiscuses such as rose mallow can flower their first year if started early enough. Tropical hibiscuses may take from five to 18 months to bloom from seed. Tropical hibiscus seeds will germinate more quickly if they are nicked and soaked prior to being planted, while hardy hibiscus seeds generally require soaking only. To nick the seeds, place them on a cutting board. Holding a single seed between the jaws of needle-nosed pliers, scratch a tiny piece from its most rounded side with the tip of a utility knife. You should be able to see a white spot that indicates that you have broken through the seed coat. 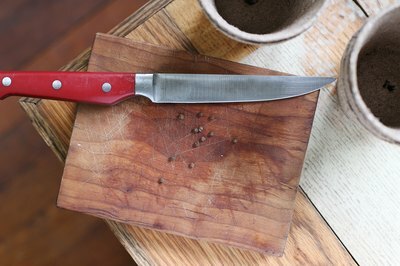 If you prefer not to deal with a knife, you can use the pliers to rub the rounded side of the seed against an emery board or sandpaper until a white spot appears. 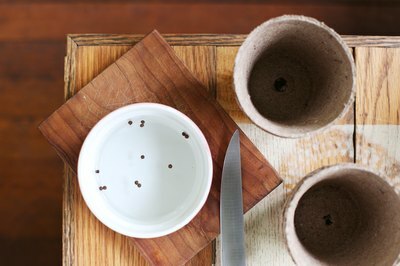 Soak all hibiscus seeds, whether nicked or not, in hot water overnight before planting them 1/4 to 1/2 inch deep in seed starting mix indoors or garden soil outdoors. You can sow about 10 seeds, 1-inch apart, in a 4-inch pot or plant them 1 inch apart in a garden row. Seeds that have been nicked, sanded or soaked will generally begin to sprout within two days to one month. Those that weren’t pretreated may take much longer. If starting the seeds indoors, cover their containers with plastic wrap, and place them at room temperature on a sunny windowsill or beneath a grow light timed to run for 12 hours per day. Remove the wrap when the seedlings begin to emerge. Outdoors, keep the row well-watered until the seeds germinate. Once the seedlings have two sets of leaves, feed indoor seedlings twice a week and outdoors seedlings once every two weeks with a fish emulsion such as 2-4-5, mixing 1 1/2 teaspoons of the emulsion per gallon of water. You can transplant the seedlings when they are 2 to 4 inches tall. Give each indoor seedling its own 4-inch pot of potting soil, and reduce its feeding to once every two weeks. Move outdoor seedlings to their permanent positions in a site with full sun and humus-rich, well-drained soil, planting hardy hibiscuses at least 3 feet apart and tropical hibiscuses 3 1/2 to 5 feet apart. In the colder zones, when indoor seedlings have reached 8 to 12 inches in height and the threat of freezing weather has passed, they too can be transplanted into their permanent garden site for hardy hibiscuses or into 1-gallon pots for tropical types.